Hi, my name is Melissa and I am not afraid to admit that I am a Disneyholic! My family loves to travel, with our favorite destination being Walt Disney World. Let me put my wealth of Disney knowledge to work for you, absolutely free! Currently specializing in vacations to Universal Orlando and Disney Destinations including: Disneyland, Walt Disney World, Disney Cruise Line, Adventures by Disney, and Disney’s Aulani Resort. 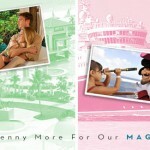 Contact me to assist you in creating magical memories that will last a lifetime! Contact me at 985-774-1148 or email me. Melissa invites her clients to share their own experiences working with her. Please email your testimonial and include a photo from your trip if you can!